I’m on the Lovestruck blog hop this week. It’s heroes who leaves us completely smitten. There’s one in particular I adore. Aethan. From the get-go it was a flammable chemistry that drew him and Echo together. They couldn’t stay away, circled each other in the early stages. I love how he’s thrown for a loop when he first meets her and acts so against his usual reserved self… he’s charmed, annoyed and totally aggrieved that she wouldn’t bend to his will. Yes, you guess it. I’m talking about Absolute Surrender, my paranormal romance set in urban New York. Being the generous person I am, I’ve included a part of that scene at the bottom of this blog if you want to find out more. It’s a tale of absolute devotion. From the moment he saw her, he wanted her, only to realize what an impossible relationship theirs was. She is his salvation and he’s her demise. Theirs is a love story that transcends the realms. Immortal guardian, Aethan, walks eternity alone, trapped in a hell of his own, until a feisty mortal crosses his path—a female he shouldn’t even look at, one who shakes the precarious foundations of all that he is—and who’s determined to walk the edge of danger. “I have no idea what you’re talking about.” With an impatient hand, she brushed back the hair from her eyes to reveal a star-shaped scar above her left brow. So she didn’t want to talk? “Okay, we’ll do this your way. Whenever you’re ready.” He crossed his arms and waited, ignoring the pull of the wound on his shoulder. He could read nothing off her mind. Her thoughts were walled up behind pure steel. It didn’t matter because none could play the waiting game like he could. Besides, he usually got what he wanted. A low, frustrated growl left her. She made him want to smile. Nothing in his long life had prepared him for the sensations crowding him. Blood buzzed in his veins and rushed to his head as he faced a female who affected him like no other ever had. He knew he was on a headlong collision with disaster, and yet he remained. Intrigued. Challenged by her. The wind picked up, rustling the fallen leaves around them, and whipped at her hair. Brown eyes glittered in irritation. Something about them seemed different, before he could determine what it was, she turned away. “You killed some…one,” he told her. “Yeah? Prove it. Besides, what are you, the Goth cop?” She leaped off the bench and brushed passed him, leaving behind a trail of her heady scent. Goth cop? That stumped him for a second. Then reality surged through him. Urias! What the hell was he doing, playing her game? If she were the female they searched for, he’d have to find out her abilities. With her snippy attitude, he’d have as much luck getting her to admit to that as getting her to reveal how she killed the demonii. Not many humans could take down those fuckers, especially not a fragile female. With his mind back on the job, he went after her. She spun around when he brushed up against her back. Shot him a glare of exasperation then she stalked off, mumbling something about wretched pheromones being the bane of her life. Aethan offered no apology for his actions. He got what he wanted. If this was the only way to get her to talk, so be it. Her belligerent attitude was toast. That seductive mouth flattened, her gaze pinned on the blade. He knew better than to get too close and give her a chance to nab the thing from him. “I don’t think so. This is sharp. You could hurt yourself.” He deliberately ran a finger over the blade’s edge and had the pleasure of witnessing her irritation increase. 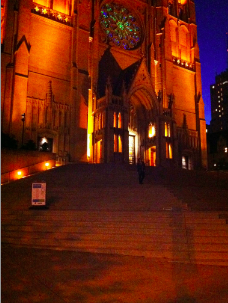 A furious glower flayed him, before she stomped off to the front of the cathedral. He followed, amusement filling him. Slipping her blade into his coat pocket, he watched as she chased off a tabby cat pawing through her bag. Then just to see those eyes spark again, he stepped closer. And now to the prizes. 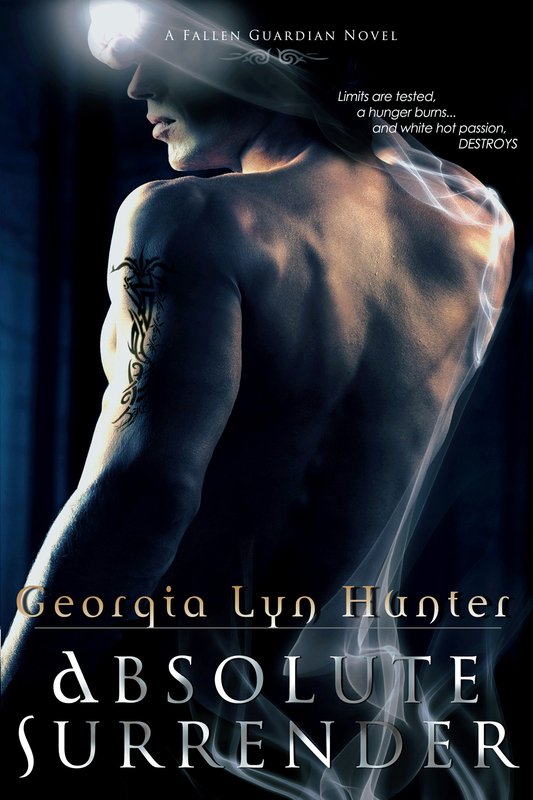 I’m giving away 2 ebooks of Absolute Surrender to two lucky commenters. (kindle or PDF) Make sure to leave a way I can contact you. Facebook, twitter, or email or even in this comment section below. By entering, you agree that should you win the e-copies, it will not be shared or regifted! Thank you for taking the time and stopping by. Don’t forget to stop at the next blog on this hop and discover more authors and some fantastic books! Thank you for the giveaway. These books sound great. I’ve added to my TBR list. I loved the excerpt. Your book sounds wonderful. I love paranormal adventures, and this sounds like a romantic adventure indeed! I would love to win a copy. Thanks for the opportunity. michelle_willms@yahoo.com. Love paranormal. Thanks for the giveaway. Enjoyed the excerpt , looks a really good read. Thanks for the chance to win a copy. I loved the book excerpt. I added the book to my book wish list. What an exciting book! Thanks for sharing the great excerpt and thanks for the giveaway. thanks everyone for taking part in this fun blog. The winners will be announced tomorrow.